The eighth episode is an awkward place to begin. Some of you may not be caught up on AOS, and some of you may have no clue what's going on, so I will attempt to give you a brief recap of Season 2 thus far. A lot has happened in eight episodes, so bear with me. After the fall of S.H.I.E.L.D. (post-Winter Soldier) HYDRA is more powerful than ever, and only a few loyal S.H.I.E.L.D. agents remain to combat the evil. Actual S.H.I.E.L.D. Dad Coulson and his team (Malinda May, actual S.H.I.E.L.D. Mom; Skye, a whiz hacker with mysterious parentage; Fitz, a technical engineer recovering from hypoxia; Simmons, a preppy biochemist; Mack, a mechanic - also known as the Fitz Whisperer; Hunter, a field agent and snark extraordinaire; Bobbi, a field agent and Hunter's ex-wife; and Trip, a field agent with dimples) are attempting to bring down the villainous HYDRA fanatic Daniel Whitehall while figuring out Skye's parentage AND attempting to find a mysterious city. Ward, a former HYDRA/S.H.I.E.L.D. double agent is a loose canon searching for closure to his troubled past, and an alien object known as the Obelisk may be a key to bringing about...the apocalypse? Another rift in space and time? World peace? Nobody knows. This may very well have been the best episode of the season. My mouth even dropped open a few times, and there was a great deal of cheering and punching the air. Everyone was at their full capacity (except May, who had like one line, and Mack, who had like one line) and it was glorious to behold. Whitehall's past as German HYDRA butche - uh, scientist - Weirner Reinhardt - was explored and his apparent immortality explained (it had nothing to do with the One Ring, but was almost as cool). 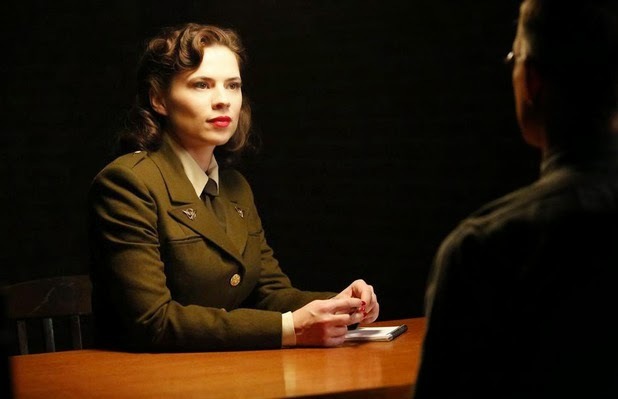 We also got to see him interrogated in the 1940's by Peggy Carter. In fact, I managed to get a hold of the actual script for both of her scenes! Interestingly, they were both identical. We discovered how Reinhardt/Whitehall has managed to keep his middle-aged appearance since World War II. He forced a nameless woman (aka Anya, bit the dust on The 100 last week) to touch the Obelisk, but instead of turning her to stone, as it's done with every test subject before...nothing happened. Whitehall is captured and sentenced to a high-security prison called "The Rat" for forty years before he is broken out by an actual rat and returned to his position as HYDRA psychopath scientist. There he discovers something interesting - Anya is still alive, and looking good. Very good. Strangely good, really. She hasn't aged a day. Whaaaaaaaaat? So the poor woman is dissected and experimented on in a scene that, if you didn't hate Reinhardt already, will fix that right up for you. Turns out, if you take as much from her as you can, and put it into yourself, you can be young, too! Anya (seriously, what was her name, because I can't keep calling her Anya) is now dead - what's left of her, anyway - and Reinhardt no longer looks like an eighty-year-old man but a vigorous, cadaverous, younger version of himself. Namely: Daniel Whitehall! Oh, yeah, and while Carter was questioning Reinhardt/Whitehall with the sheer force of her awesomeness, he also mentioned a myth concerning the obelisk where 'blue angels came bearing a gift meant to save all mankind.' Save or end. Either/or, it isn't like there's much of a difference, anyway, right? We saw a blue alien when Coulson retrieved the GH.325 last season. There were blue aliens in Guardians of the Galaxy. To secure the satellite, Coulson is taking Trip and Fitz with him while Skye and a team of random tech people we've never seen before do their technological thing. Elsewhere in the plots; Skye's Dad tells Whitehall that the Obelisk 'chooses' worthy people, and these mysterious ones will be able to enter the mysterious temple in the mysterious city and do something mysterious. True story! Meanwhile, the good guys are interrogating Bakshi (who is holding up surprisingly well) and digging through SSR files to find Reinhardt/Whitehall and get some useful dirt on him. Boy, do they find some interesting things; including Whitehall's former identity as Reinhardt and his stolen 'fountain of youth' transformation. Bobbi questions Bakshi about the file they found, but as things start to heat up, Bakshi insinuates that Bobbi did some pretty awful things to become trusted in HYDRA during her stint as a spy there. Upset, Bobbi pushes Bakshi harder until he decides to abruptly end the conversation in a way that only matches Odin's Odinsleep for its efficiency and abruptness – he slams his head on the table and collapses to the floor, foaming at the mouth. Yes, they checked for cyanide, but he had hidden cyanide! Whaaaaaaaat? Concerned that Bobbi may have pressured Bakshi because she was afraid he would spill all her dirty little secrets, Hunter confronts her about it, and they argue. In fact, they argue so much that clothes come off and they retreat to an SUV for some mono a mono time. Coulson and the others are trying to pull all the pieces together and hook up the satellite, but as luck would have it, there are quite a few enemy soldiers down there. While Fitz (YAAAAAAY, FITZ!!!) works on his satellite link-up, Trip and Coulson take out the soldiers – until Trip is shot (twice). Poor Trip. I mean, he's hardly had a story all season, and now this? Fortunately, there's a doctor hiding on hand to save/endanger Trip's life. Whew! In spite of my urging Coulson, very loudly, not to accept, Coulson accepts. 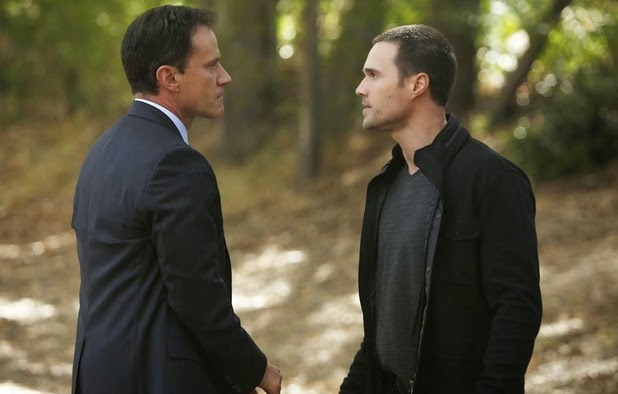 While all of this excitement has been happening, Ward has abducted his slimebag brother Christian and taken him to their old family property, where he tosses Christian a shovel and tells him to dig up the well where their youngest brother, Thomas, almost died. He's attempting to force Christian into admitting that he's the one who manipulated Ward into nearly killing Thomas when they were kids. Christian does an extraordinarily good job of combining the truth (“You always blame others for your mistakes”) with lies (“I didn't kill Tommy!”) - I mean, the man almost had me convinced that my baby (Ward) had actually done it, and the flashback we saw in Season 1 was a lie! But in the end, Ward gets the truth out of Christian – Christian hated Tommy because Mommy Dearest loved him best, and he wanted him dead. They apologize, hug, and skip into the sunset, friends again. Awww! Um, until it shows up on the news that their parents and Christian were killed in a murder/suicide, complete with a confession (Ward, you sneaky devil, hiding a recorder while Christian babbled!). So not only does Skye's father return to HYDRA HQ, so does Ward! ...in which Skye's dad finds Anya's dead, mutilated body in the woods (I teared up. The poor woman has died twice in two weeks) and holds her close, swearing revenge on Whitehall. SO SKYE ISN'T AN ALIEN, BUT SHE HAS OBELISK BLOOD. AND NO WONDER SKYE'S DAD WENT BACK AND ATTACKED THE VILLAGE AND NO WONDER HE'S WORKING FOR WHITEHALL ADN WHAT IS WARD UP TO AND WHEN CAN WE CALL THE MYSTERY CITY ATTILAN BECAUSE REALLY!!!!!! I need episode nine, stat. What are your thoughts? Will Trip survive? Is Ward really HYDRA? (Hint: No! It's a covert plan! Sneaky Ward!) Is Bobbi secretly a villain? Will Fitz and Simmons ever be FitzSimmons again? Is Christian really dead? Where is Tommy Ward? How can Raina manipulate the entire situation and come out on top? (I'm pulling for you, Raina!) Was it possible Skye's mom was Mantis? Or Jolt? Or Wing? This just in - the blue aliens are, in fact, Kree. AAAAAAHHHHHHHHHHHHHHHHHH. MIRRIAM! I'm an episode and a half behind due to Hulu. But this recap was FANTASTIC and I loved it and you and GAAAH!!!!! Cannot wait to watch this one! This recap was a blast! I actually haven't seen any S.H.I.E.L.D. since season one wrapped up--the arc pacing frustrated me overall, AND the only ones I really cared about were Ward and Fitz (and look how that worked out), so I decided to take a break from it. But I recently watched the pilot of Bones, and I realized how much a show can shine once it sheds its first season, hits its prime, and really comes into its own. I decided I needed to catch up on S.H.I.E.L.D., but I haven't gotten around to it yet. This makes things a little more urgent, haha. Though I'm really, really concerned about what's become of Fitz since I stopped watching.... Fun stuff, I'm sure. What happened to Fitz is heartbreaking. Don't watch it. If you don't want to have your feelings crushed, don't watch it. If you do want to have your feelings crushed, definitely watch it. Best use of GIFs to describe the fan experience that I've seen in a long while. Awesome review! THANK YOU. "On Saturday, I post about The 100!"